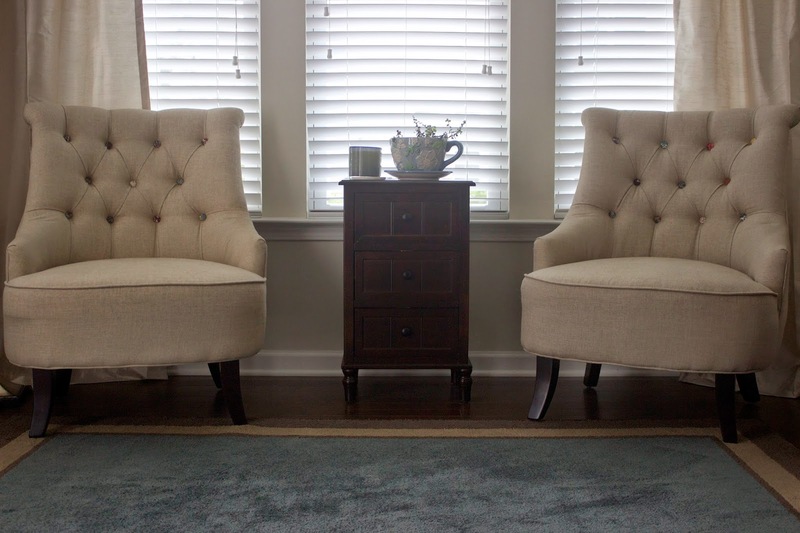 Ever since we moved into our home in December, I have had a new obsession with accent chairs. In our teeny tiny Hoboken apartment we had little room for any furniture but the basics so I am especially enjoying this aspect of decorating our new home. My favorite accent chairs adorn our sunroom. I loved them ever since I saw them online a year and a half ago but didn't think I would be able to convince my husband to let me purchase them for a dominant space in our home. 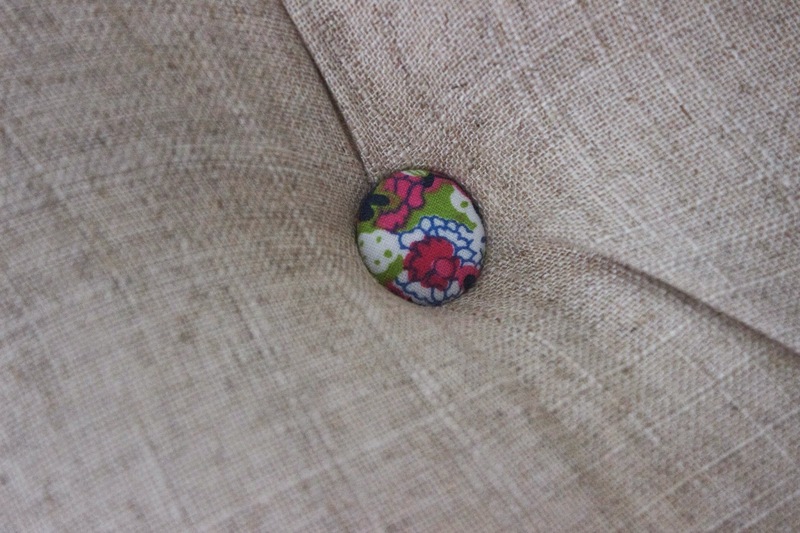 I thought he wouldn't like the fabric-covered buttons. It turned out, though, that Corey actually really liked them. Why? They brought the perfect touch of modern and fun to an otherwise traditional linen tufted chair. 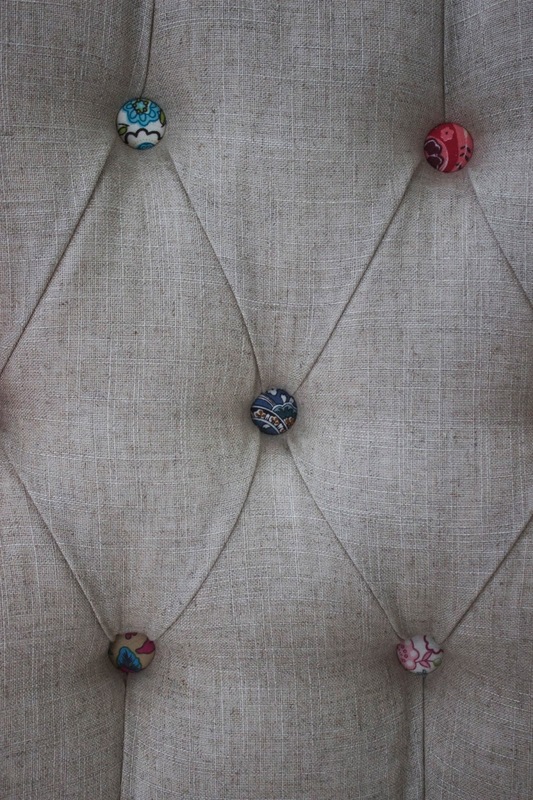 Each button is covered in a different fabric. This is so neat because no two chairs are exactly the same. I love what a statement an accent chair can make and how much they can really brighten a room. This is my favorite space to sit and drink coffee in the mornings. Riley is also completely obsessed with this space. In an effort to help promote One Kings Lane's statement chair campaign, I wanted to share with you my favorite accent chair from our home. One Kings Lane's A Complete Guide to Modern Chairs is a great resource for how to style statement chairs in your home and has really inspired me to think outside the box. I have now moved along to search for the perfect chair for our home office. Looking for home decor inspiration? Check out One Kings Lane's Resource Guide. Or get an invitation to shop the deals here. I'm posting a little later than normal today. Better late than never? I'm joining in on the 5 on Friday fun today to share some of my favorites from this week. I used the last drops of my beloved Lancome foundation earlier this week to look put together enough to head over to the wall. I've been hearing great things about Estee Lauder's DoubleWear foundation so I picked up a bottle of it to try instead. I may or may not have been swayed by the Lilly Pulitzer gift with purchase. 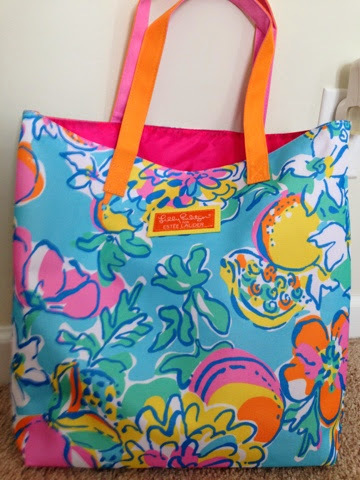 Meet my new beach bag, which will spend a lot of time pool side with me this summer. On of my most favorite things about having time off work during the summer is being able to have lunch dates with my sweet husband. 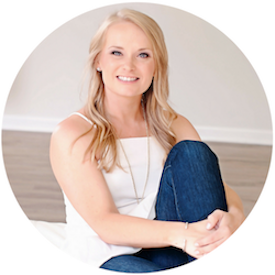 While I love teaching, it can leave me feeling stretched really thin and feeling a little guilty for the time I have to spend away from my home and husband. 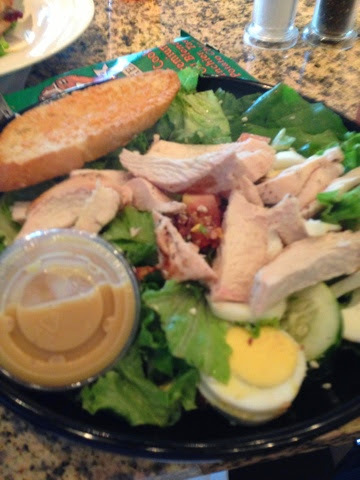 Lunch dates in the summer are such a sweet, sweet treat. This week we finally got to try Crisp in Dilworth and it was so delicious. I have recommitted myself to barre this summer after being really slack with it for the last two months. When I'm tired and stressed, a good workout is the first thing to go, even though I know deep down this is counter-productive. 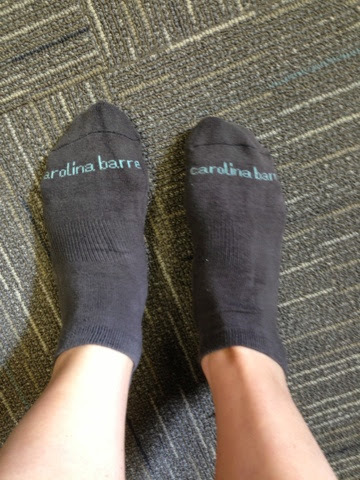 I've been back to going to Carolina Barre & Core three times a week and then doing a 30 minute cardio + Barre 3 mini workout twice a week. I treated myself to a mani and glass of wine last night. Usually, I do my own nails but was feeling the need to be pampered. The color is Mod About You (I think) by O.P.I. 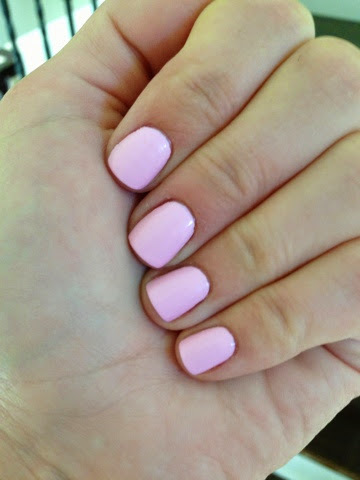 and although I usually am totally loyal to Essie, I really like it. 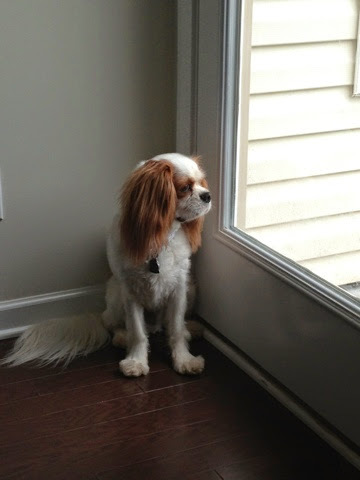 I've been taking this sweet boy on lots of walks and we've done our share of snuggling on the couch watching HGTV this week but he spends most of his time staring out our back door. Ever since we visited Corey's parents in Florida this spring, Riley has been absolutely 100% obsessed with trying to catch frogs. What a silly boy. Now that the school year has officially ended and my work clothes have been dry cleaned and returned to my closet where they will stay until August, I feel like I have absolutely nothing to wear each day. Granted, I am spending my entire mornings in workout attire, but I still definitely feel my summer wardrobe needs a major refresh. 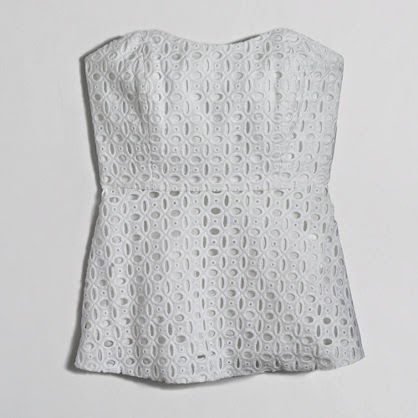 I've got a few gorgeous pieces on my radar right now. What summer items are you currently lusting over? Last summer, Corey and I were perusing the aisles of Costco one Saturday morning when we came across a flank steak in a cilantro lime marinade that looked simply delicious. We picked it up, grilled it the next day, and made tacos. What a delicious meal it turned out to be. Recently, I set out to recreate the marinade and we have enjoyed these delicious tacos several times since. Combine cilantro, lime juice, olive oil, and garlic in a small bowl. Stir, then drizzle over flanksteak. Place in the refrigerator for several hours. Grill to desired doneness while heating corn tortillas in the oven. Dice steak into small pieces and place inside tortillas. 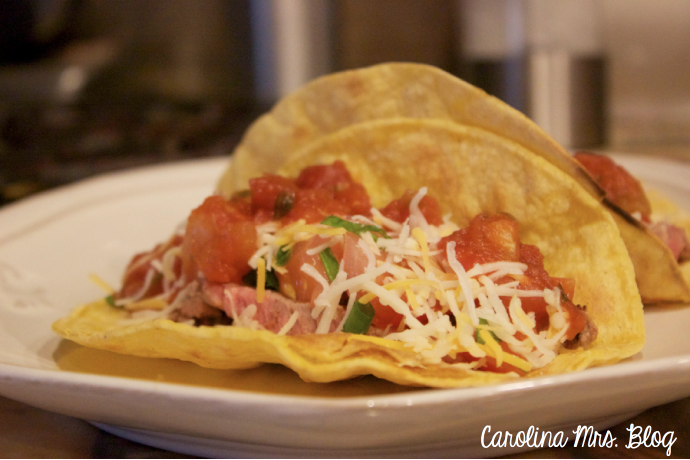 Top with your choice of toppings (pickled onions, cheese, and salsa are my favorites) and enjoy! If you know me, then you know I couldn't make it through the day without my morning coffee. It is sad, but true. I am addicted to caffeine. I seem to always be in a rush, having my mornings calculated to an exact science. There is no time to stop at Starbucks before my fifty minute commute. I simultaneously make my coffee, a tervis tumbler of water, and my lunch at the same time. 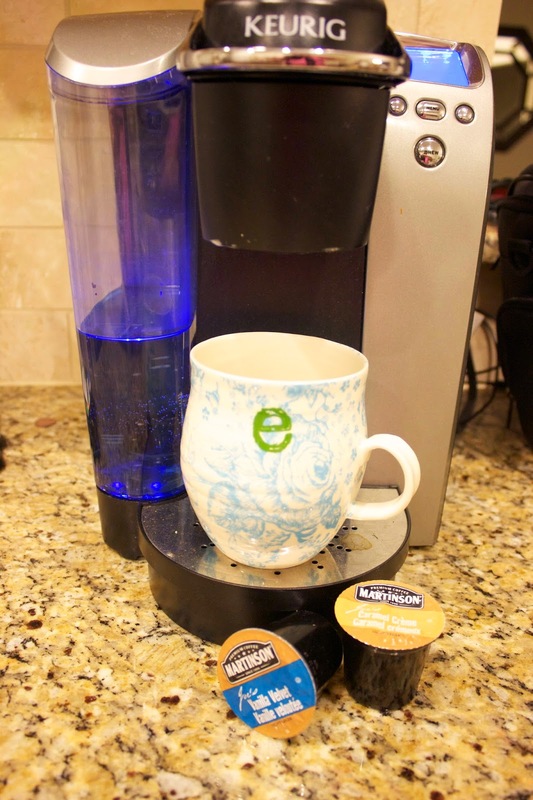 Thankfully, my Keurig gets the job done pretty fast. Just the way I like it. 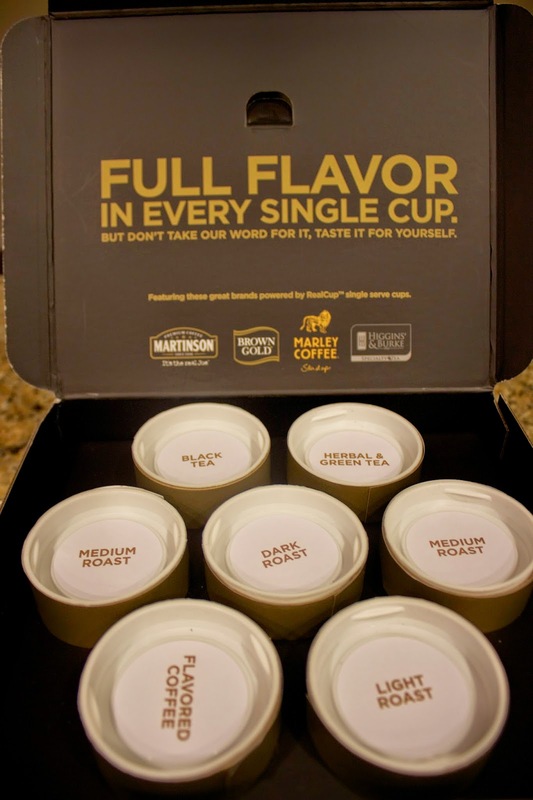 Real Cup coffee recently contacted me and asked that I review some of their products. This was, of course, right up my alley so I eagerly agreed. Days later, I received a shipment of delicious coffees in a variety of roasts, including a few fun flavored varieties, and hot teas. The variety in this pack was truly impressive. What I really liked about the coffees from Real Cup is that there were lots of different flavors to choose from. Granted, I can be a creature of habit (read: don't mess with my coffee routine), it is always nice to try a couple different flavors. They were all good. 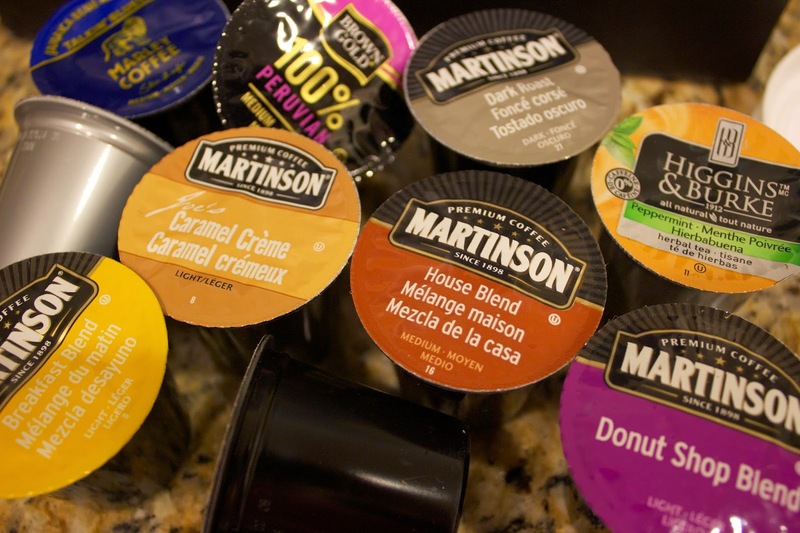 The Marley Coffee bold roasts and vanilla velvet flavored coffee pods were my favorite. I love that these are available in both variety packs or in bulk in the flavors you prefer. And oh, the convenience of having them shipped to your door! I received my second shipment of Real Cup coffee this week and I have to say it was a lifesaver when they arrived on a crazy, hectic day when my supply was running low to know I wouldn't need to brave the grocery store for coffee for the rest of the week. If you're a coffee addict like me but haven't tried Real Cup before, I highly suggest you give them a try now.